"The magic of Disney Interactive and Squaresoft will take gamers of all ages on a magical journey through a universe that we are all familiar with..."
Kingdom Hearts is the joint effort between two gaming powerhouses, Disney Interactive and Squaresoft. This game is probably one of the most talked about games of 2001 and 2002 and Kingdom Hearts is finally here and it brings gamers into the world of Squaresoft's Final Fantasy series and one of the most loved and known universes of all, the magical world of Disney. 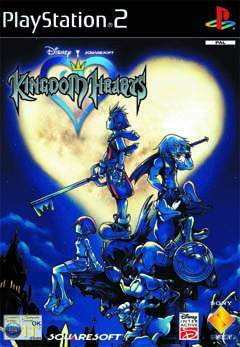 Kingdom Hearts isn't your average RPG game but an amalgam of an arcade and RPG game that ensures that the fun factor is always there. Kingdom Hearts is the story of young boy named Sora who lives on Destiny Island with his family and friends, Kairi and Riku. Sora and his friends have been dreaming of strange universes filled with colourful and wondrous characters. So enthralled by these dreams that they have decided to build a raft in order to explore these strange worlds. Unfortunately for Sora, his dreams have become more troubling then the others and he dreams of dark creatures that are trying to destroy everything that is good and colourful in the world. When Sora is sleeping at nights, he is somehow looking into other universes as he sleeps and he will soon become one of the most pivotal instruments in existence. This darkness is slowly effecting one of the Disney universes where King Mickey Mouse resides over. Mickey Mouse has discovered this insidious plot and plans to stop this darkness from destroying his world. Mickey Mouse has left a strange and cryptic message to his most trusted advisors, the Magician known as Donald Duck and the Captain of the Royal Knights, Goofy. These two unwilling heroes have been sent to Traverse Town to search for the Key that will allow them to travel to other worlds. 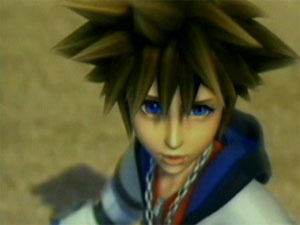 Unknowing to them, the key is actually wielded by the boy called Sora. The darkness knows that Sora is the wielder of the keyblade and sends his servants to retrieve the blade and destroy anything that gets in their way. A dark storm engulfs Destiny Island and the trio of friends are broken up and sent into other worlds. Sora eventually arrives in Traverse Town where he meets his future companions, Donald Duck and Goofy. They tell Sora of the danger that threatens not only his universe but also their universe. Sora's only wish is to find Kairi but he reluctantly accepts the task given to him by Donald Duck and Goofy. Together they must find Mickey Mouse, Kairi, defeat this unknown darkness and save not only the universe but the very multiverse. Kingdom Hearts has a very in-depth storyline that travels through just about every Disney universe ever conceived of. You will meet familiar faces that include the Little Mermaid called Ariel, Tarzan, Hercules, Peter Pan and even the dark characters from Disney that include Captain Hook or the wicked witch from Snow White. 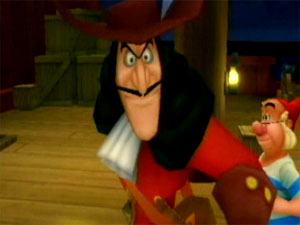 Kingdom Hearts boasts that just about every animated Disney character will be in this game. 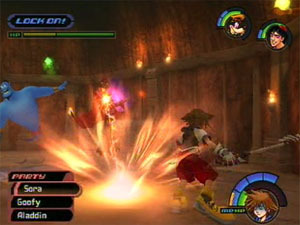 The gameplay of Kingdom Hearts is based on your classic RPG game where you must play a certain role such as a warrior or magician. Before the game starts, you must select what kind of character you will play in the game and this is done through a series of questions that Sora must answer at the start of the game. Once your character is selected, the game will give you a small tutorial on how to play the game. This tutorial shows you the basics of the game such as jumping, using your sword and opening or breaking boxes open. By defeating enemies in the game, you are awarded experience points that lets you increase your abilities. Enemies also leave behind items and powerups to assist in the gaming world. Primarily the game is a combat game but there are a variety of different puzzles in the game to keep the most hardened gamer interested. The controls are quite simple and informative but one of the most annoying problems of Kingdom Hearts is the camera angles. Unfortunately this is one of the most frustrating features of the game and you must use the shoulder buttons in order to move the camera angle around. Another ability that is sorely missing from the game is the ability to move the camera angle up or down which can become really frustrating when you are trying to perform some arcade moves in the game. The game does contain a very constant frame rate but on occasion, especially when there is a large battle, the frame rate does suffer. Graphically as with all Squaresoft titles, Kingdom Hearts is a gamers delight. It features some of the most simplistic graphics around but it really looks like you are in a Disney Cartoon. When you visit the various Disney universes such as the worlds of the Little Mermaid or the Nightmare Before Christmas, it actually looks like you are really there. The game also contains some of the most beautiful cinematics that I have ever seen and merges extremely nicely with the ingame graphics. Although the characters look a little simple, they suit the game perfectly. Kingdom Hearts is a perfect world filled with amazing 3D graphics and a plethora of Disney characters that look like their animated counterparts. Another impressive feature of the game is the perfect voice acting of all the characters in the game, especially the Disney characters. When you first hear Donald Duck talk, he sounds exactly like him and that goes for all other characters. Actors and singers such as Billy Zane and even Mandy Moore have performed extra scenes for the game to give it that personal touch. The music of Kingdom Hearts sounds like a mellow version of the music from the Final Fantasy series, a combination of orchestral and midi instruments. The sound effects in the game, whether its the noises of the beach or the sounds of battle all come together perfectly. Kingdom Hearts does take some time getting use to, especially trying to control the camera angles but apart from these little glitches, the game is truly a masterpiece of modern software. The game would be a little difficult for young children but apart from them, its perfect for the rest of the gaming world. Come into the familiar universes of Disney and Squaresoft for an epic struggle between good and evil. Kingdom Hearts is a graphical treat that offers an exceptional storyline that is backed by some brilliant character acting. Highly Recommended!